Recently, the hooded sweatshirt, or “hoodie”, has been elevated from ubiquitous casual wear to political statement in the aftermath of a tragedy. An earlier and very different tragedy led to the widespread adoption of hooded space suits. By the end of 2011, hooded soft-helmet space suits had been used 284 times, by 23% of all space flyers, and those numbers will increase for the foreseeable future. In 1973, the resumption of Soyuz launches after an interruption of 15 months was marked by the first Soviet space suits since 1965. In 1971, the three Soyuz 11 cosmonauts died before re-entry when their capsule accidentally depressurized a hundred miles above Earth. 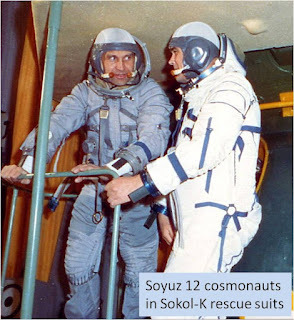 Starting with Soyuz 12, cosmonauts would wear protective suits during launch and landing, as a second line of defense against cabin pressure loss. As a young space geek, fascinated by the “look” of space technology as well as by its functionality, I immediately noticed that the new Russian suits lacked the most identifiable features of previous space suits: hard helmets and neck rings. Instead, pliable fabric hoods with built-in transparent faceplates clamped shut at the front of the neck to ensure air tightness, and could be folded back behind the head when not needed. These Sokol-K “rescue suits” were manufactured by the Zvezda design bureau in Moscow, makers of all Soviet and Russian space suits before and since then. (“Sokol” is Russian for “falcon”). The Sokol-K was as compact and light-weight as possible, but its associated life support equipment displaced one person, so only two cosmonauts flew where three previously rode in the already cramped Soyuz reentry capsule. As a young patriotic space geek who grew up in the 1960s and 1970s, an era of rampant Russophobia, I naturally assumed that the soft-helmet Russian suits were “inspired” by the soft-helmet suits worn by American astronauts on a single space mission, eight years earlier. Frank Borman and James Lovell wore light-weight G5C-model suits made by The David Clark Co. for their record-setting 14-day Gemini 7 mission in 1965. (The “C” in “G5C” stood for Clark.) Astronauts on the preceding four-day and eight-day Gemini missions blamed much of their post-flight fatigue on the confinement and discomfort of their heavy G4C-model suits. These were reinforced for extravehicular activity (EVA, or space walks), and weighed 14.4 kg, including a 2.8-kg helmet with multiple visors. The G5C had only two layers and weighed 7.4 kg, including a 2.2-kg aviator’s helmet. It could be removed for comfort, and Borman and Lovell were the first people to doff, and later don, space suits in-flight. The Americans approached suit-less spaceflight tentatively. NASA had long recognized that space suits were a compromise between functionality and comfort, and that functionality outweighed comfort. In 1963, the B.F. Goodrich Company had developed the G2G-model suit for Gemini flights (the final “G” in “G2G” stood for Goodrich) which featured a removable hard helmet, sleeves and legs, leaving only the torso of the suit to be worn continuously. But problems with this suit kept it from being accepted for flight. Before the G5C was adopted, the astronauts training for both Gemini 7 and its eight-day predecessor, Gemini 5, wanted to fly their missions in more traditional pilot garb: standard coverall-style flight suits and aviators’ helmets with oxygen masks. Gemini 5 commander Gordon Cooper and Elliot See, the backup co-pilot, demonstrated that concept inside their spacecraft during vacuum chamber testing. The fourteen-day Gemini crew had been the backups for the four-day crew, and saw first-hand their post-flight fatigue. In anticipation, Borman and Lovell’s official crew portrait showed them in their preferred space flight ensemble: light blue flight suits—complete with white scarves!—and aviators’ helmets with dark sun visors and oxygen masks. But NASA and the spacecraft manufacturer were more concerned about crew safety if the capsule lost air pressure in space, and about thermal and humidity control in the spacecraft. So, both crews’ requests were disapproved. In an ironic twist, the eight-day Gemini crew not only didn't fly suit-less, but—because EVA was originally planned for their mission—they had to wear their G4C suits the entire flight! Under continued lobbying by the astronauts, NASA Headquarters agreed that the Gemini 7 crew not use existing pressure suits during the 14-day mission. The new, light-weight G5C full pressure suits were developed and certified just in time for their flight. After Gemini 7, the last five Gemini flights lasted no more than four days, and all used the G4C suits because they all had EVA planned. The next opportunity for American astronauts to fly suit-less would be aboard Apollo, when even standard space suits could be removed in the comparatively spacious cabin, so the astronauts could spend most of their flights in casual comfort. NASA considered the G5C for use for launch and landing on Earth-orbital Apollo missions, but its peripheral vision was too limited. NASA revisited the hooded soft suit in 1968 for Apollo, and again in the 1970s for Space Shuttle, but they were not pursued. The Soviets had dispensed with space suits almost entirely starting with the first Voskhod flight in 1964, when fitting three men into a re-purposed one-man Vostok capsule meant providing the minimum necessary life support equipment. 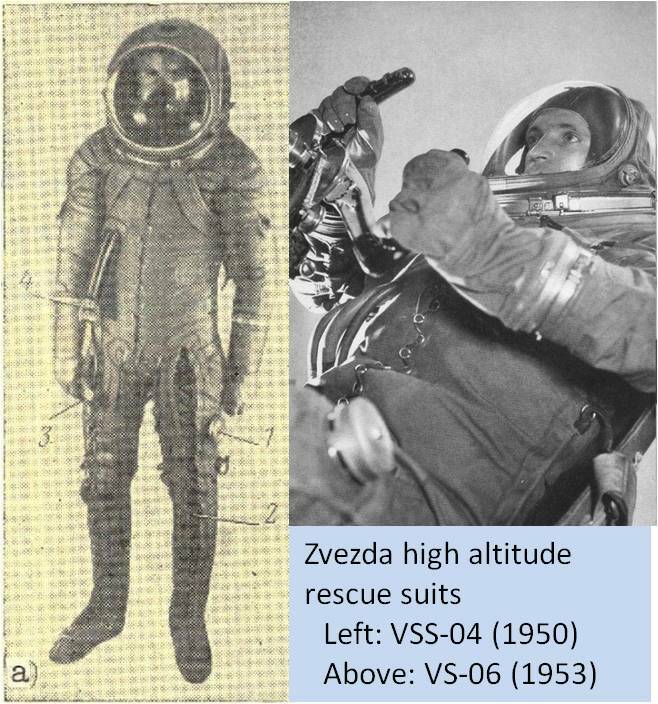 Except for two missions with spacewalks, all Voskhod and Soyuz crews from 1964 to 1971 wore only “training suits” (what we would call “track suits”) from launch to landing. When the Soyuz 11 tragedy proved the necessity of a pressure suit as backup to the spacecraft life support system, they considered modifications of several existing light-weight high altitude suits, and selected the Sokol aviation suit. But to fit into the existing crew couch, they eliminated its hard helmet and re-used a concept they developed as early as 1953: a large soft hood helmet with a clear visor, clamped to the torso of the suit with two hinged semi-frames (think of almost any lady’s purse). Interestingly, the aviation suit's soft helmet reverted to a hard helmet starting in 1956 because, when opened and swung behind the head, it interfered with the airplane seat’s headrest—not a problem on Soyuz, when the cosmonauts can float out of their seats in weightlessness. Going even further back, one of the first hooded pressure suits was a British suit from the 1950s, which resembled the G5C but was found inadequate. And, of course, U.S. Air Force partial pressure suits from the 1950s had a soft hood covered and sealed by a hard, impact-resistant shell. The Sokol-K evolved through the unflown –KR, -KM and –KV variants to the Sokol-KV2, introduced in 1980 and still in use today. Another variant, named the Strizh (“swift”, like the bird) rescue suit, was developed for the Buran space shuttle program and used in the Tu-160 "Blackjack" high altitude supersonic bomber. Chinese astronauts on the Shenzhou spacecraft wear rescue suits that appear identical to the Sokol-KV2 and are probably produced in China under license from Zvezda. In my youth, I assumed that the soft-helmet space suit must have been a recent American invention. But as it happens, such soft-suits were not new, nor were they of American origin. I even briefly wondered if David Clark had “borrowed” the idea from the Russians, since Soviet propaganda had been showing the soft-helmet suits for years. In the end, it was probably just another example of parallel evolution: smart designers of all nationalities can come up with solutions to their problems, and similar problems lead to similar solutions. Interestingly, after dispensing with pressure suits for several years, both the Soviet and U.S. space programs resumed using such suits during launch and landing after space flight fatalities caused them to reconsider the wisdom of flying without such protection. The Soviets had a graphic demonstration of their value on Soyuz 11. The Americans adopted them in a convoluted response to the “what-if” question about crew survival of an in-flight emergency less abruptly fatal than occurred on Challenger. But neither party recognized the other’s decision as relevant to its own circumstances: each had to experience a tragedy, suffer the consequences and then learn from it. I began working on this essay on Nov. 3, 1994, and finished it up on March 31, 2012. Edits for corrections on April 1, 2012. --, “Hoodie” at http://en.wikipedia.org/wiki/Hoodie (last accessed March 31, 2012). --, “Sokol space suit” at http://en.wikipedia.org/wiki/Sokol_space_suit (last accessed March 31, 2012). --, “Soyuz 11” at http://en.wikipedia.org/wiki/Soyuz_11 (last accessed March 31, 2012). --, “Strizh” at http://en.wikipedia.org/wiki/Strizh (last accessed March 31, 2012). Abramov, I.P., and A.I. Skoog, Russian Spacesuits (Chichester, U.K.: Springer-Praxis, 2003). Alekseyev, S.M., and S.P. Umanskiy, "High Altitude and Space Suits" (translation from Russian original, 1973), NASA Technical Translation TT F-15165 (Washington, D.C.: NASA, Jan. 1974), at http://ntrs.nasa.gov/archive/nasa/casi.ntrs.nasa.gov/19740007684_1974007684.pdf (last accessed April 1, 2012). Borman, F., and R.J. Serling, Countdown (New York: Silver Arrow Books, William Morrow, 1988). Brooks, C.G., and I.D. Ertel, The Apollo Spacecraft, A Chronology, NASA SP-4009, vol. III (Washington, D.C.: NASA, 1976). Ertel, I.D., and R.W. Newkirk, The Apollo Spacecraft, A Chronology, NASA Sp-4009, vol. IV (Washington, D.C.: NASA, 1978). Grimwood, J.M., and B.C. Hacker, with P.J. Vorzimmer, Project Gemini: A Chronology, SP-4002 (Washington, D.C: NASA, 1969). Gruenfelder, Michael, "'Bears' & 'Blackjacks', The strategic bombers of Divisia Engel's", Air Fan International Vol. 2, No. 2, March 1997, pp. 24-30. Hacker, B.C., and J.M. Grimwood, On the Shoulders of Titans: A History of Project Gemini, NASA SP-4203 (Washington, D.C.: NASA, 1977). Kozloski, L.D., U.S. Space Gear: Outfitting the Astronaut. (Washington, D.C.: Smithsonian Institution Press, 1994). Mallan, L., Suiting Up for Space, The Evolution of the Space Suit (New York: John Day Co., 1971). Morse, M.L., and J.K. Bays, The Apollo Spacecraft, A Chronology, NASA SP-4009, vol. II (Washington, D.C.: NASA, 1973). Newkirk, D., Almanac of Soviet Manned Space Flight (Houston, Tx. :Gulf Publishing, 1991). Slayton, D.K., and M. Cassutt, Deke! U.S. Manned Space From Mercury To The Space Shuttle (New York: Forge, 1994). Learned something new today! Thanks, JBC.